Miami is bursting with reasons to visit. If you’re looking to #FindAReasontToGo then check out our guide to just some of what’s on in Miami 2017. Ringling Bros. and Barnum and Bailey’s ‘Out of this World’ show is now on at the AmericanAirlines Arena until January 15. If you’re quick you might just catch it. If you happen to be in the area this weekend, then you’re in luck. The 40th Annual Art Deco Weekend, hosted by the Miami Design Preservation League will be held on Ocean Drive, Miami Beach. You’ll find lawn parties, classic cars, live music and theater, dancing (particularly the Charleston variety! ), street fairs and a retro fashion show. There’s something for all ages. Liberty City, Miami will play host to this celebration of history and pride – starting at 11.00am on NW 54th Street. This world-class auto-racing event will attract some of the world’s greatest drivers to do battle in some of the world’s best race cars in Marlins Park – home of the Miami Marlins. Miami Beach plays host to the largest event of its kind in the USA. Hundreds of popular chefs, wineries and producers take part each year, offering everything from wine tasting, cocktails and parties to culinary shows. It’s a packed few days. If art is more your thing, then Coconut Grove Arts Festival welcomes talented and creative artists and performers from across the world to Miami. It’s recognised as one of the USA’s most prestigious Fine Art shows. Changing the pace slightly, Carnaval Miami begins February 20, 2017. The volunteer association - Kiwanis Club of Little Havana hosts it and it is an awesome celebration of Latin culture. It includes the Calle Ocho Festival on March 13, Carnaval on the Mile on March 5 & 6. This festival has been running since 1993 and this will be its 24th year. Cedella Marley Booker founded the event as a testament to her son, the legendary Bob Marley. It celebrates the sounds of Reggae, R&B, Urban, Latino and other types of music. The world’s biggest tennis stars will descend on Miami again this year for the renowned Miami Open. If watching world-class tennis is your thing, then there’s nowhere better to see it than under Miami skies. If you’re in town and on South Beach around this time, then you’ll be able to see riders and their horses put their jumping skills to the test. There will be free seating for visitors on a first come, first served basis. Miami becomes even more vibrant during the Miami Beach Gay Pride event when around 80,000 participants take part in the parade. There’s also a cruise and other events at local nightclubs. Memorial Day is celebrated all over the USA – when we take time to remember those who served our country in the armed forces. The weekend is also seen as the start of summer, and there are usually a host of events taking place across the city over the holiday weekend. It’s a great time to visit Miami. 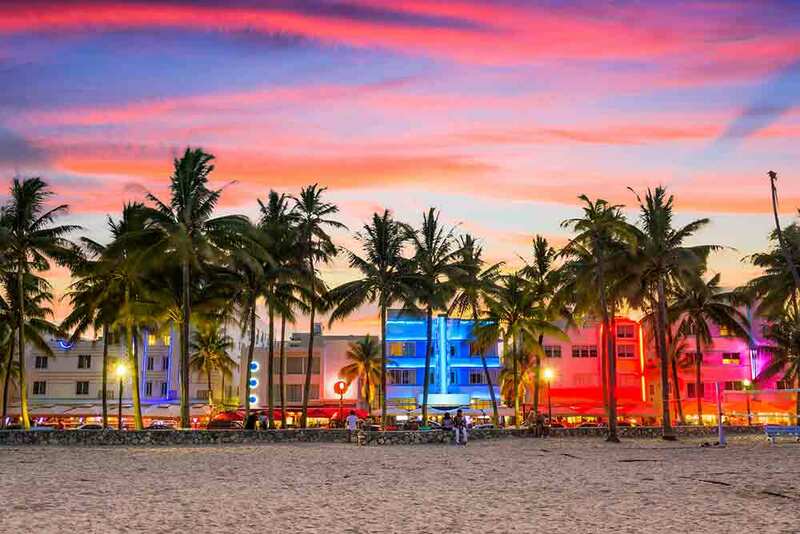 What better time to visit Miami than during the Independence Day celebrations – America’s very own birthday party. At Bayfront Park, the event usually starts at noon on Jul. 4 and there will be food, music, kids’ entertainment as well as an impressive fireworks display after dark. This is a two-month celebration of Miami’s food scene. So if you’re a foodie, as they say, then this might be a great time to tour Miami. Some of Miami’s best restaurants and chefs will offer fixed price menus throughout the period. What a great way to experiment with our cuisine! As you’ve probably guessed by now, Miami offers a diverse range of cultural events. Towards the end of August, the International Festival of Ballet takes place in 6 venues across Miami and showcases performances of 20 ballet companies from around the world. Towards the end of October, you can mark the start of the start of the stone crab season with the Seafood Festival – an annual event hosted by Coca Cola that takes place at Lummus Park, Miami. There’s usually a host of events taking place across the festival. As I mentioned above, there’s a diverse range of cultural events in Miami. Where else would you expect to see this kind of race than in Miami! This annual event sees teams race beds (yes, you read that correctly), down the streets of beautiful Coconut Grove. So, whether you want to enter a team or watch the fun unfold from the side-lines, it’s sure to be quite an experience. If you have a need for speed, but you’d rather it’s of the motor car variety instead of beds on wheels, then NASCAR Ford Championship Weekend is for you. It’s a famous and popular race, so it will sell out in advance. It’s a great experience for motor fans of all ages. Thanksgiving in the USA marks the start of the holiday season and traditionally, Thanksgiving Day itself is when we take a break and spend time with family. But it’s also a lovely time to visit Miami and experience this national holiday. Why not head out to the Everglades and see the return of some migrating birds or catch a sports game. Or head on down to Bayfront Park and see the Christmas tree being lit up over the Thanksgiving weekend. Three million Christmas lights, carnival rides, and a 92 foot tall Christmas tree – Miami is a great place to celebrate Christmas! If you’re in town at the end of the year, then don’t forget to check out this event. It’s a satirical parade in the lovely Coconut Grove with floats mocking local and national stories from 2017. It’s a memorable way to round off the year. New Year’s Eve in Miami, Dec. 31, 2017. Miami is renowned for its nightlife – so it’s a great place to celebrate the end of 2017 and the start of 2018. There will usually be parties and fireworks downtown in Bayfront Park and on South Beach. Or if you are looking to count down to the start of the new year in another kind of venue – there will be a host of restaurants, bars and clubs open whether you’re looking for something family friendly or even VIP! So – the answer to the question ‘what’s on in Miami 2017’ is that there’s always something on in Miami! Here at Gray Line Miami – we know this area inside out. If these Miami events have given you the appetite to get a taste of our area, then we are just the people to help you explore. When you visit Miami, we can handle most aspects of your trip – including your transfer from the airport to your hotel, right through to helping you to see and experience all that Miami has to offer. From tours of Miami City, to an airboat adventure of the Everglades, to a picturesque day trip to Key West or even a daycation to the Bahamas. We’ve got your time in Miami covered. “Originally going to Miami just for a sporting event, but decided to do a few things such as an Airboat tour. Mario, the bus driver who picked us up from our Hotel did some basic tourist info on the way and did a good job of explaining what to do when we got there.